Home / Health and Vitality / Mulberries – the healthy sweets you can’t stop eating! Mulberries – the healthy sweets you can’t stop eating! Looking for a healthy treat that you can enjoy whenever you want, wherever you want and without worrying about the calories? Or perhaps you’re searching for a responsible alternative to your children’s usual sweets and sugary snacks that won’t damage their health, but will keep them coming back for more? Now you can satisfy even the most powerful of sugar cravings, with delicious, dried mulberries – temptingly sweet berries that once you start eating, you simply can’t stop! The mulberry (Morus) bush, immortalised in the popular children’s nursery rhyme ‘Here we go round the mulberry bush’, belongs to the deciduous tree family of the Moraceae and grows predominantly in balmy, subtropical regions of Africa, Asia and North America. Its fruit is both deliciously sweet and powerfully medicinal. Indeed, mulberries have been used in traditional Chinese medicine for generations and are treasured for their ability to keep the heart and cardiovascular system healthy, strengthen the immune system, delay the signs of aging, lower blood sugar levels and enhance vision. There are around ten to fifteen varieties of mulberry, the most common of which are the white mulberry (whose leaves are the favoured food of silkworms), the Chinese mulberry, the red mulberry and the black mulberry. Every juicy mulberry is packed with a range of beneficial nutrients including vitamins C and K, iron, calcium, fibre and antioxidants, which each offer a wide variety of special health benefits. Mulberries boast significantly high quantities of vitamin C, which promotes a healthy immune system, offers us added protection from viruses and bacteria, helps heal our wounds, reduces cholesterol levels, increases the natural lifespan of our cells and prevents an unpleasant condition known as scurvy. Mulberries are an excellent source of vitamin K, a fat-soluble vitamin, which is stored by the body in our fat tissue and liver. Vitamin K plays an essential role in helping our blood to clot and in promoting optimum bone health. Iron is vital for the healthy function of both red and white blood cells, muscle performance and a robust immune system. A lack of iron is one of the most common modern nutrient deficiencies – according to the UK government more than 90% of British women currently receive less than the RNI (recommended nutritional intake). Calcium supports strong bones and teeth, healthy nerve function and aids muscle contraction and blood coagulation. Mulberries are rich in this important mineral, making them particularly ideal for growing children! Fibre is known to stimulate and maintain our digestive system, promote the growth of ‘friendly’ bacteria in our gut (and thus prevent infections such as Candida), encourage a healthy bowel movement, prevent constipation and slow down the absorption of carbohydrates, which can in turn aid weight management. Mulberries are brimming with powerful antioxidants, which help reduce cholesterol levels, lower the risk of cancer and heart disease, strengthen our immune system and delay the signs of aging. The British Dietetic Association recommends eating a diet rich in antioxidants as this “may reduce damage to cell DNA and cell membranes”. In particular, mulberries are rich in resveratrol, an antioxidant that acts as a natural antibiotic to fight off attack from bacteria and fungi and combat environmental stress. The same substance that is found in grapes and red wine, resveratrol is thought to promote a healthy heart and circulatory system, reduce our blood sugar levels and help prevent cancer and Alzheimer’s. Studies on mice indicated that resveratrol helped overweight mice run further and live for around 20 per cent longer and recent research has found that this antioxidant also increases the lifespan of human cells. 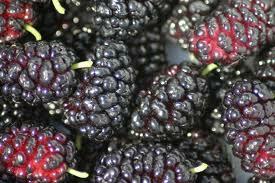 In addition, mulberries contain a generous amount of anthocyanins. Anthocyanins are flavonoids, which possess antiviral, anti-bacterial and anti-inflammatory qualities and can demonstrably reduce the risk of heart disease and stroke, delay the growth of tumours, stimulate blood circulation and improve our eyesight. With an intensely sweet flavour that is often likened to honey, dried mulberries can be enjoyed as a healthy snack straight from the bag, or as a sweet addition to breakfast dishes, trail mixes, home made raw chocolate and all of your favourite desserts. The fresh fruit is also widely used in making jams and wines. The post Mulberries – the healthy sweets you can’t stop eating! appeared first on Superfood blog - Healthy, Rawfood Lifestyle.